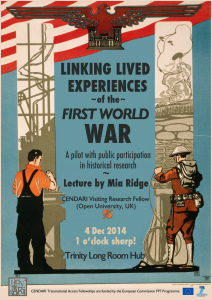 I’ve been awarded a CENDARI Visiting Research Fellowship at Trinity College Dublin for a project called ‘Bridging collections with a participatory Commons: a pilot with World War One archives’. Here’s Trinity’s page about my Fellowship, which runs until mid-December. I’ve decided to be brave and share my thoughts and actions throughout the process, so I thought I’d start as I mean to go on and post my proposal (1500 words, below). CENDARI is a ‘research infrastructure project aimed at integrating digital archives for the medieval and World War One eras’ which ‘aims to leverage innovative technologies to provide historians with the tools by which to contextualise, customise and share their research’ (source) so this research fellowship very neatly complements my PhD research. You can contact me by leaving a comment below, or via my contact page. If you’d like to follow my progress, you can sign up for (very infrequent) updates at MailChimp: http://eepurl.com/VUXEL or keep an eye out for posts tagged ‘CENDARI Fellowship’ on my blog, Open Objects. my second was ‘Linking lived experiences of WWI through battalions?‘ and the related post ‘Private Albert Henry Bailey, service number 13/970a‘ (October 10).